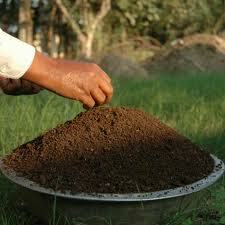 What Ratio of Mixture is ideal for Vermicast Versus Soil for planting in pots, garden or a farm? I have been asking myself and have been asked many times regarding the right composition and mixture of soil to vermicast is ideal for planting and I must admit that I do prefer it much better to answer today. The reason is because I have searched and researched online to find out an ideal ratio and proportion for mixing soil with vermicast and so far, none of them would tell which is best. Today, after visiting a local vermicast production and vermiculture or worm farm in Bay (Bae) Laguna, the TRP Vermifarm, I came to know by asking from the very experience of the people using their own product and surprisingly, here is what I found out. After buying 40 kilos of rich and newly harvested vermicast with TRP, I came accross with one of their trusted employee (forgot her name). She said that according to their own experience, vermicast does not really have an ideal mixture composition or ratio with respect to soil if you are to use it. What they do, according to the lady is that they put an amount enough for the roots of a plant (in this case – they used longkong lanzones) and put it right below at the bottom of the planting pot or plastic pot. That way, the roots of the plant would reach out where the best mixture is. 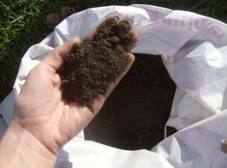 According to this pdf information on vermicast uses, the ideal mixture (not necessarily stated) is set at 50% soil and 50% worm castings. But then again, the uses above will give you a clue as to which use will need more and which will need a minimum amount of the soil conditioner. I call it soil enhancer or condition because it does not necessarily have all the properties of a fertilizer but it has what it takes for a soil to return to its vital and fertile state back a few decades ago when the land was very much good for plants of any kind in the planet. Today, with the endless degeneration bombardings due to excessive use of chemicals and destructive non-organic materials. Me and my wifey, Ana will be using our 40 kilos of the worm poop tomorrow as the new year 2013 starts in revitalizing our old potting soil mix. Hopefully, we can grow more healthy organic produce from the seeds which I bought from the Bureau of Plant Industry in Quirino, near Taft Avenue last year, December 2012. If you happen to read this post and you are from the Philippines, I will soon be featuring the new schedules of trainings and seminars to be launched by the BPI for 2013. Hopefully, this will include vermicomposting technology which we both are excited to learn more about such as here from where a tropical country is. Worms do behave differently in Asia and the Philippines is one of them so we can’t help but get excited to attend the said seminar training. Not sure though how much is the fee. Again, I will announce it here, soon. So be sure to secure your slot in being one of the first to know about it if you are interested in organic farming, container gardening or backyard gardening in your home or small space somewhere out there.